There is something magical, almost surreal, about Disneyland that allures me. I never did get the chance to visit Disneyland as a child and for a long time, I held onto a dream that one day I would. It wasn't until I turned 24 that this dream came true. Back then, I was not married, had no kids and yet, Disneyland felt like paradise. I will never forget how it had the power to make me feel like a child, and a very happy one, all over again. 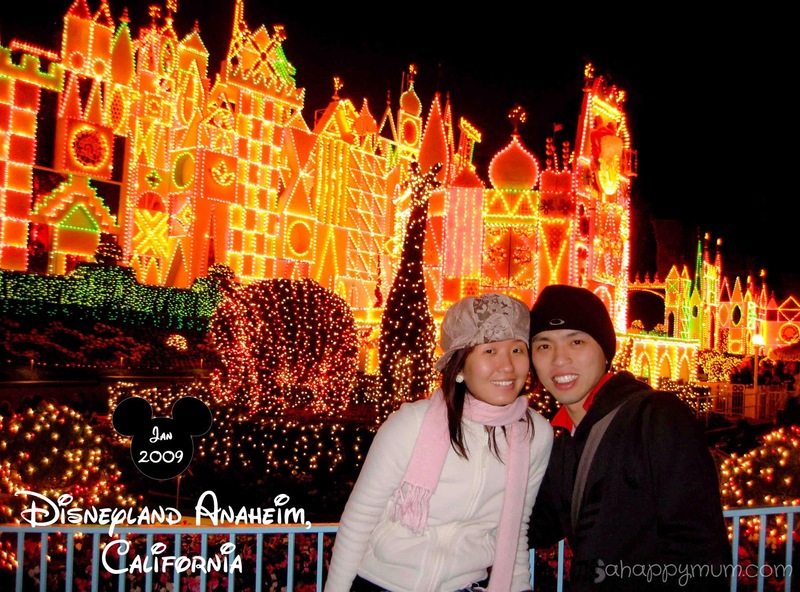 On our honeymoon, we visited the first and original Disneyland Park as newly weds who were in the mood for some magic and fantasy. I was just thankful that we had a chance to revel in the fun of going on all the rides together, hand in hand, and not needing to look after kids. During our summer holiday in Sweden, we went on a three-week road trip around Europe and stayed in the Disneyland Hotel in Paris. 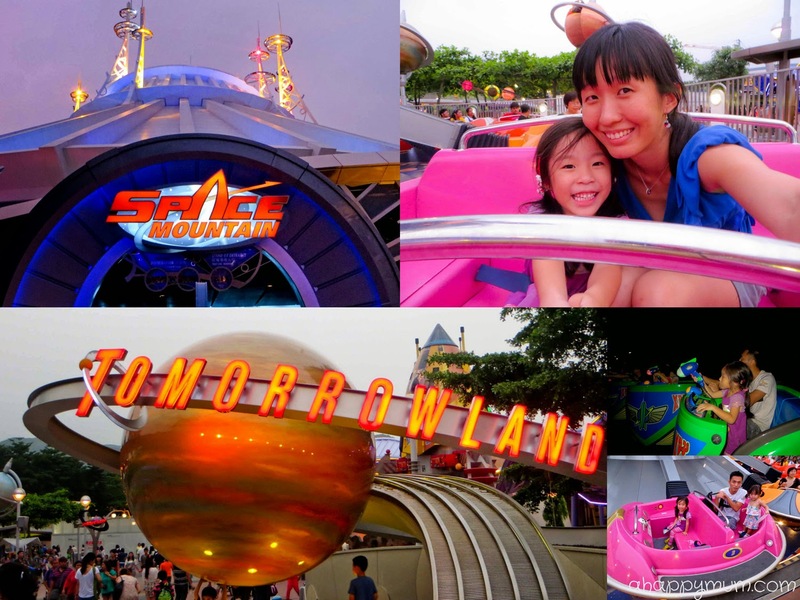 It was my first visit as a mum and even though I brought with me a different mindset this time, it wasn't just my kid who was mesmerised by all the magic, I was too, again. 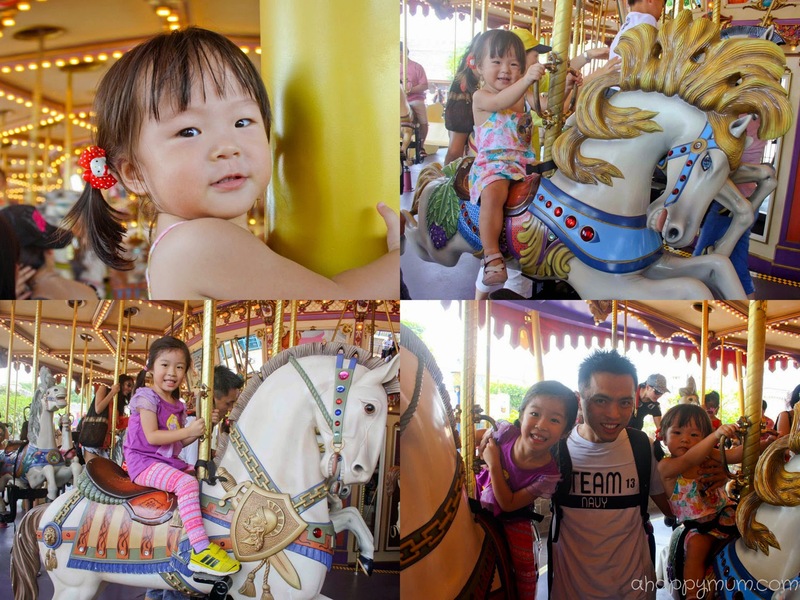 This year, we made it to the Disneyland in Hong Kong and it was a dream come true for the kids. Even though it was over before we realised it, we had a great time playing, laughing and bonding as a family. 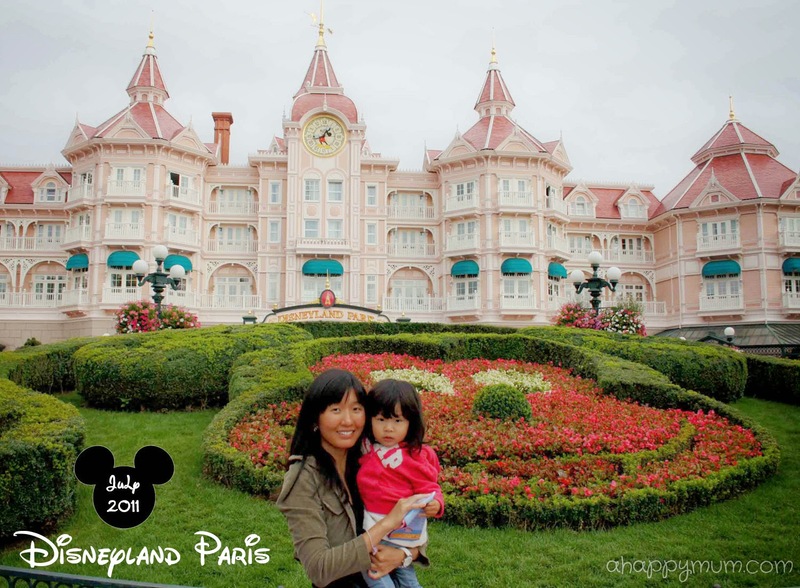 Today, I'm sharing with you more pictures from the trip and some tips for a family trip to Disneyland. The fact that the park opens at 10am doesn't mean you have to be there when the gates open. If your kids are early risers and you can get there on the dot or earlier, good for you. But if your kids are like ours who tend to sleep late and wake up late on vacations, it is okay to let them get a little more rest. More importantly, make sure they have a substantial breakfast and also bring along some snacks or finger food to keep their energy levels up. To cut down on the waiting time, you can also pre-book your park tickets online. The Hong Kong Disneyland is very much accessible by the Mass Transit Railway (MTR) via the Disneyland Resort Line and the directions are clearly displayed at the stations. 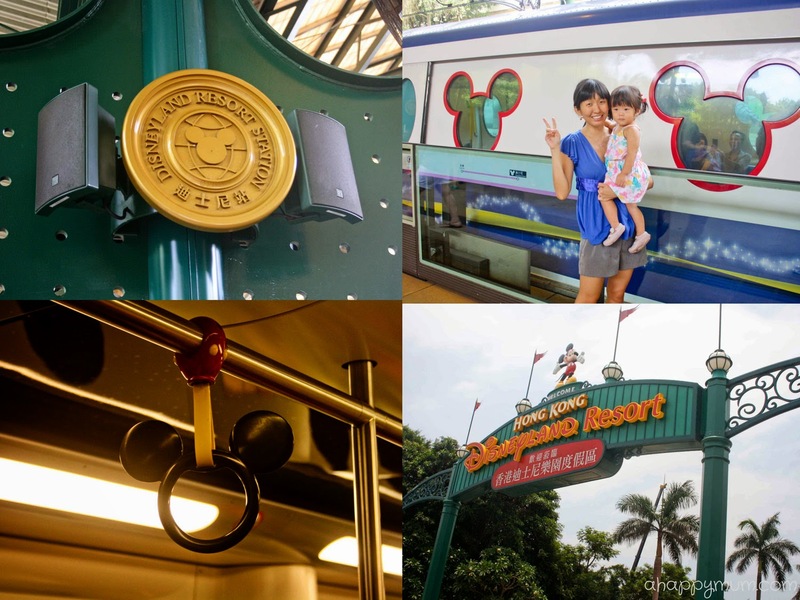 We were impressed that the Disney themed train came complete with bronze statues, Mickey Mouse shaped windows and grab handles! It is good to check the weather forecast beforehand but if you do not have a choice of dates, do not let the weather deter you from having fun! Always be armed with an umbrella, caps, sunscreen lotion, water and extra clothes for the kids. For us, we like to be dressed in casual wear and running shoes when we know that we are in for an entire day of walking and exploration. In any case, just make sure everyone feels as comfortable as can be! The first thing to do after you enter the park is to grab a copy of the guide map and the show times. 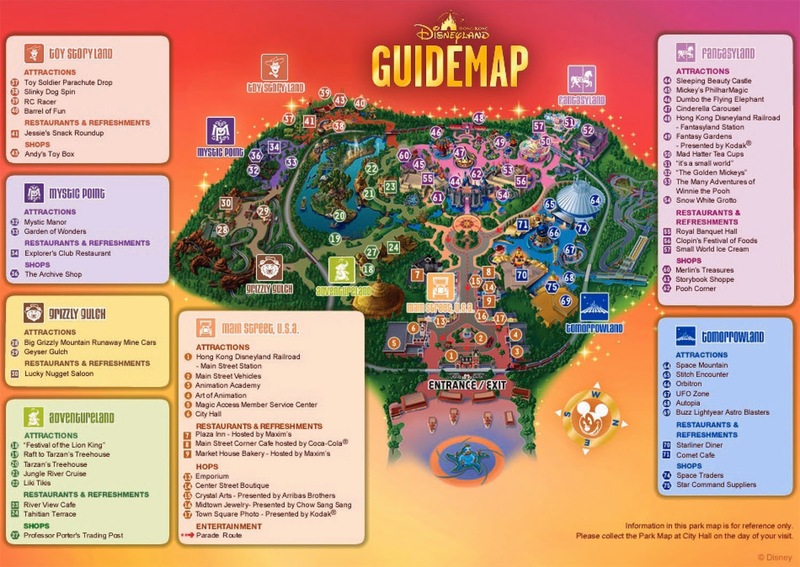 If you have time prior to the trip, you can view or print a copy of the Hong Kong Disneyland map here. It would be hard to explore the whole park in just one day and we don't want to be constantly rushing around, do we? Unless you have more days to spare, if not, it is better to plan your route if you are there for a single day. 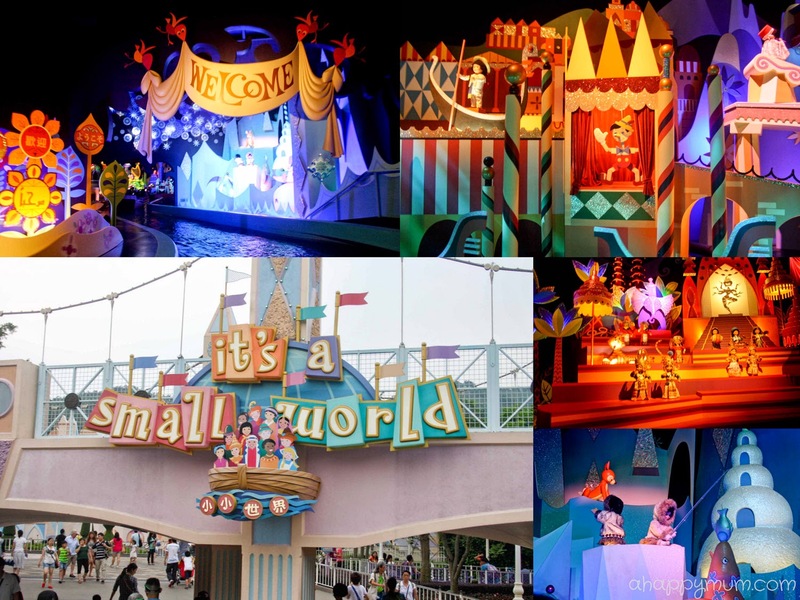 Take into consideration your child's age, height limits for rides, preference for shows and characters to meet, and decide which of the lands (For Hong Kong Disneyland - they are namely Adventureland, Fantasyland, Grizzly Gulch, Mystic Point, Toy Story Land, Tomorrowland and Main Street, U.S.A) you wish to focus on. Of course, don't forget to snap more pictures and take some videos as precious keepsakes. Especially if these are milestones and achievements for your little ones. 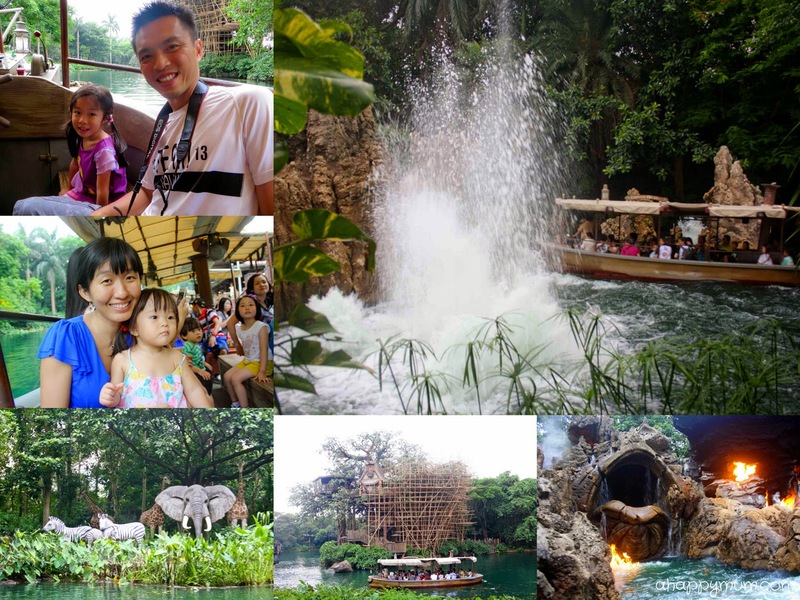 Our favourite ride in the park is the Jungle River Cruise in Adventureland where we got to go on a river voyage and brave mysterious jungles where surprises were in wait for us at every bend - from hippos, elephants to spiders and even volcanoes! 4) Save a place, get a FASTPASS! This is a tip you have to know. In Disneyland, there are certain rides that allow you to get a FASTPASS (view sample here). What this means is that at the participating attractions, you can insert your park admission tickets, take a FASTPASS ticket, leave, enjoy the rest of the park and return later during your stipulated timing to enjoy a FASTPASS queue. Before you jump for joy and think of going around the park to obtain all the FASTPASS tickets, the rule of thumb is that you can only have one FASTPASS at a time. To find out when you may receive the next one, look at the bottom of your current FASTPASS. 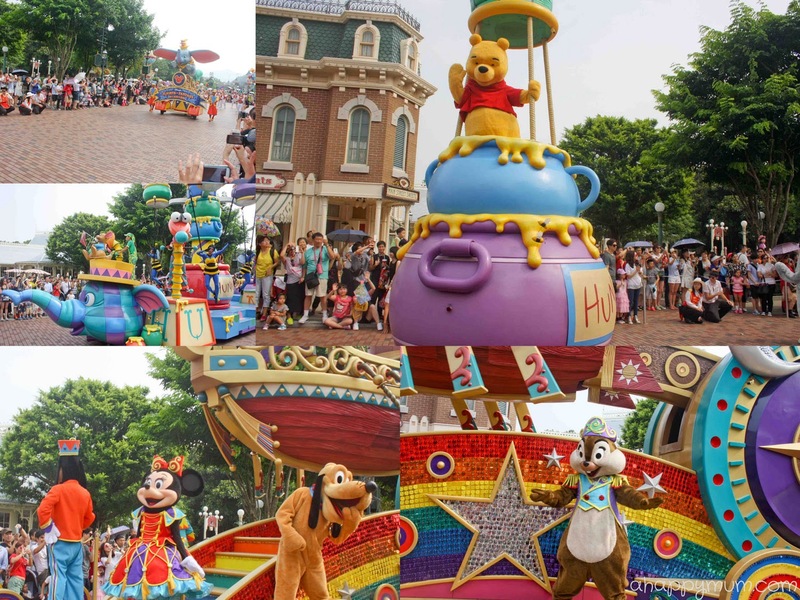 Currently, Hong Kong Disneyland's FASTPASS attractions include 1) Space Mountain in Tomorrowland and 2) The Many Adventures of Winnie the Pooh in Fantasyland. From past experience, the FASTPASS tickets do help to significantly reduce the waiting time and given that you do not need to pay extra for them, it feels good to be able to rightfully cut the queue when your turn comes. 5) If the kids like the ride, go again! 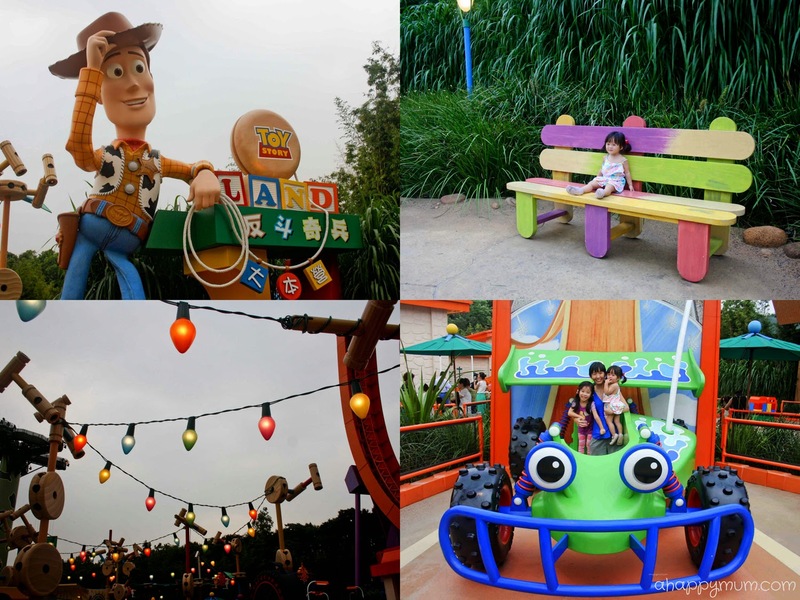 If there are certain attractions that delight the kids, and don't require too much of waiting time, don't shun away from the thought of riding twice and missing out on other rides. It is not about completing as many rides as you can, it is about making the kids feel on top of the world and having fun as a family. In fact, it will not matter if you do not finish touring the whole park, that means you can always come back again next time! One of the biggest thrills in Disneyland is getting to meet and greet the well-loved Disney characters. While you can get to see them easily around the park, it is not that easy to come up close with all that you love and it takes a good amount of time waiting in the queue. I would suggest just selecting 3-4 characters that your child really loves for photo-taking and leave the rest of the time for exploring the park. 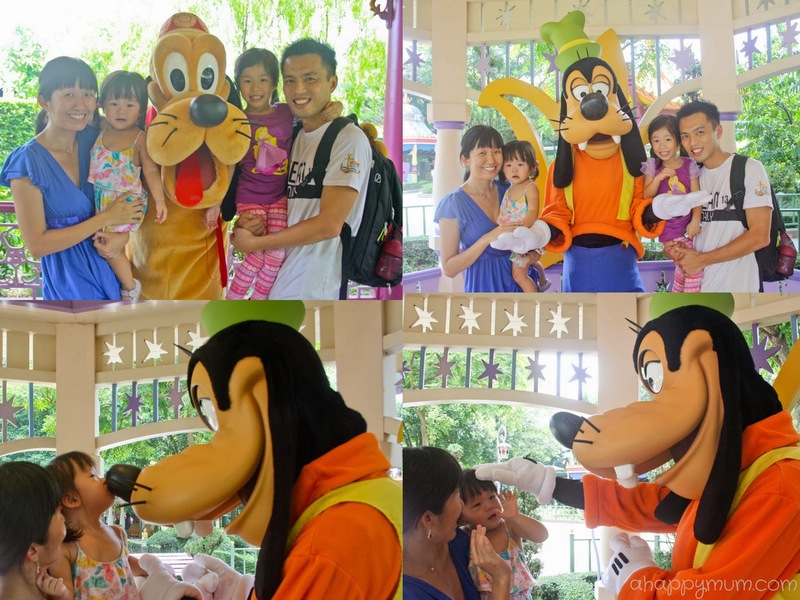 One good thing I love about Hong Kong Disneyland is when it is your turn, the staff gives you plenty of time to interact with the characters, like letting your kids give them hugs, kisses and high fives, and they are always on standby to help you take lots of beautiful family photos. It didn't feel like a rushed affair like it usually does and that made the wait worth its while. 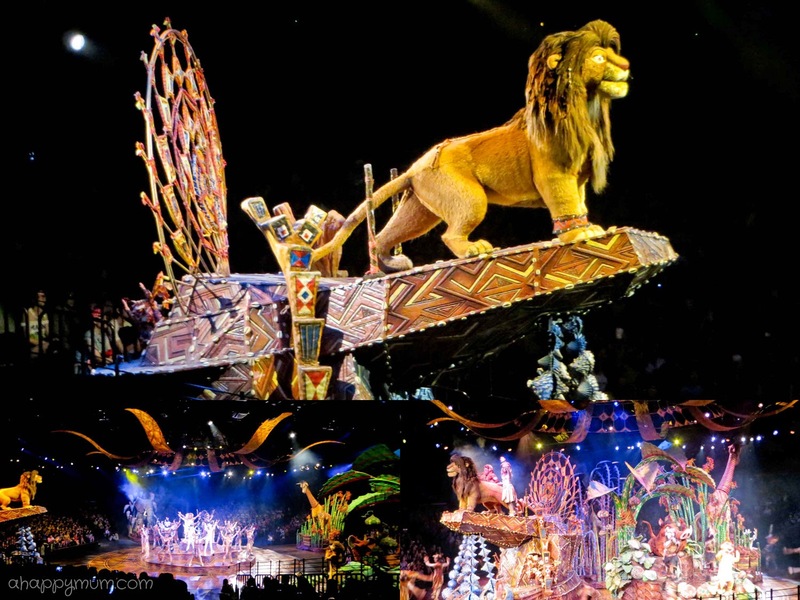 If you like to catch the stage shows in Hong Kong Disneyland - Festival of the Lion King, The Golden Mickeys and Stitch Encounter, do factor in the time you need to get there and plan to arrive early so as to secure seats. We watched the Festival of the Lion King which is a live stage musical complete with songs, dance, puppetry and visual effects. It was an awesome experience and even the kids were fascinated from start to end. We would have loved to watch The Golden Mickeys but alas the last show was already full when we arrived. Thus, if you wish to catch all the shows, make sure you leave ample time in your schedule. The parade is always the highlight at every Disneyland. 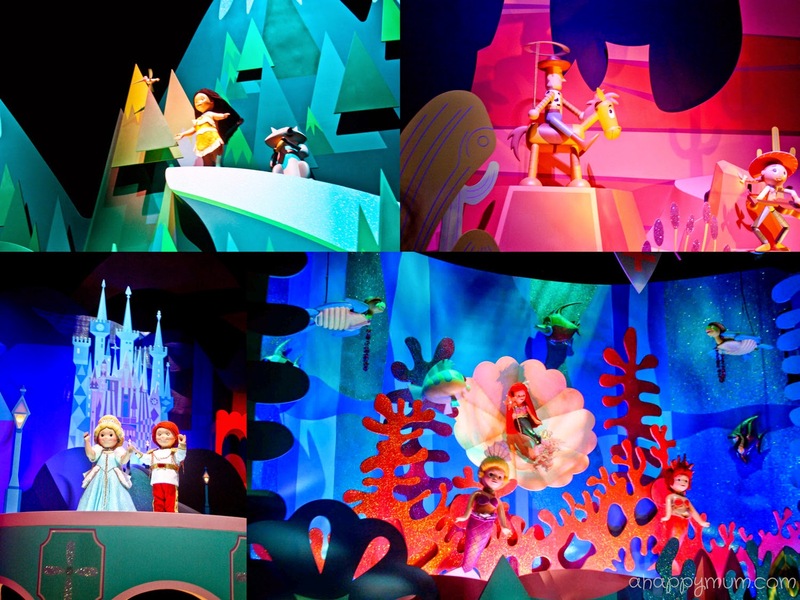 With the catchy music, vibrant floats and friendly waves from the characters, it is a fantasy come true for every kid. 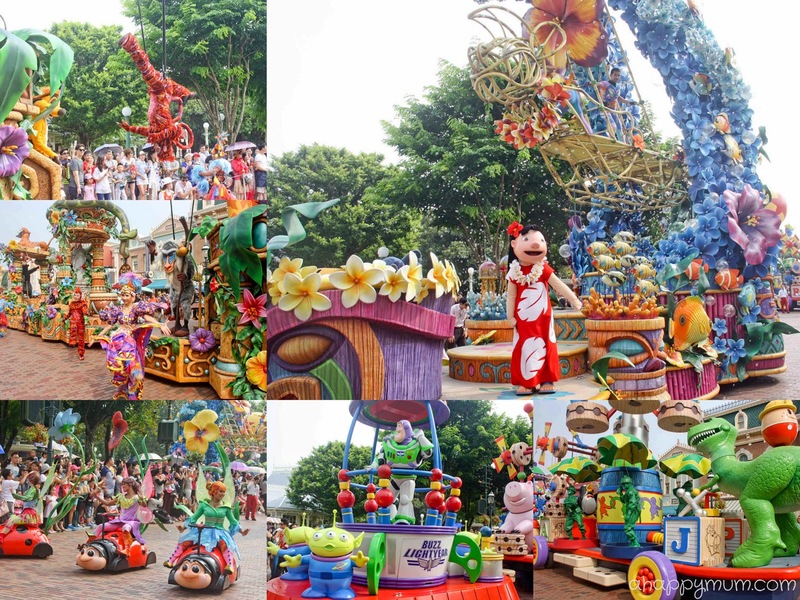 For Hong Kong Disneyland, the "Flights of Fantasy" parade takes place at 3:30pm (subject to change) and there is only one parade every day instead of two - a day and a night parade - that we had seen in other Disneylands. So, if your kids still need their afternoon naps, try to wake them up in time to watch this awe-inspiring parade that is sure to be a hit with the little ones. While I don't recommend standing in the hot sun just to secure the front row seats, I think this is definitely a performance not to be missed. Update: We heard that the night parade "Disney Paint the Night" will be launched in October this year, so that sounds totally exciting!! It can be exhausting walking around and standing in wait the entire day, so as and when you can, sneak in some breaks and a good lunch for the kids. Also, always make sure that they stay hydrated. 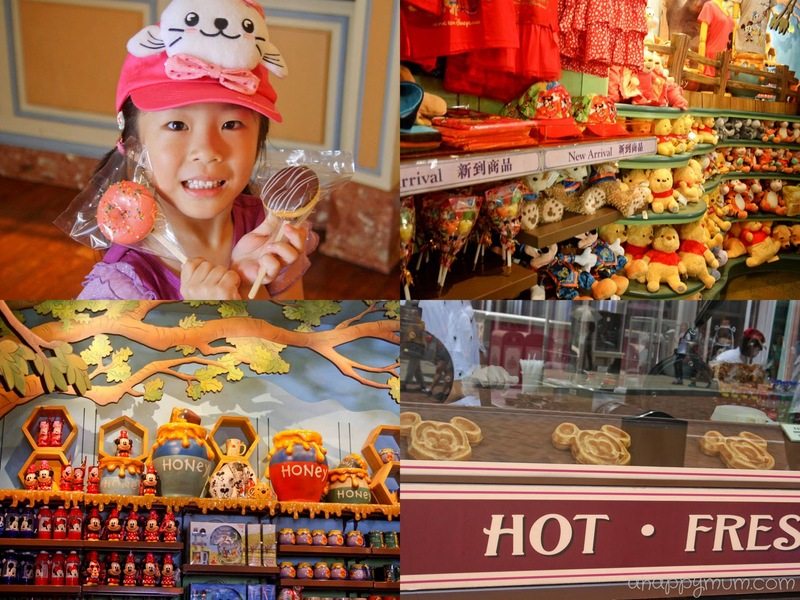 For a complete list of dining and shopping options in Hong Kong Disneyland, go here. If you happen to visit the Main Street Corner Cafe hosted by Coca-Cola in Main Street U.S.A, do check out the delectable Surf and Turf and unique Sulley's Blue Frightener - soda water with curacao syrup and blueberry boba, it even comes with a LED light cube that turns on when in contact with water which you can bring home as a souvenir. I'm sure many of us have heard about the kidnapping cases and rumours of children getting abducted. My word of advice is that while there is no need to be overly jumpy and paranoid, it is better to be safe than sorry. Therefore, always make sure you hold on to your kids and do not let them wander off into the crowd, go to the washroom by themselves or run around when waiting for the rides. While keeping a lookout at all times, do make sure you carry with you a happy heart and make the most out of every moment during your magical experience in Disneyland. 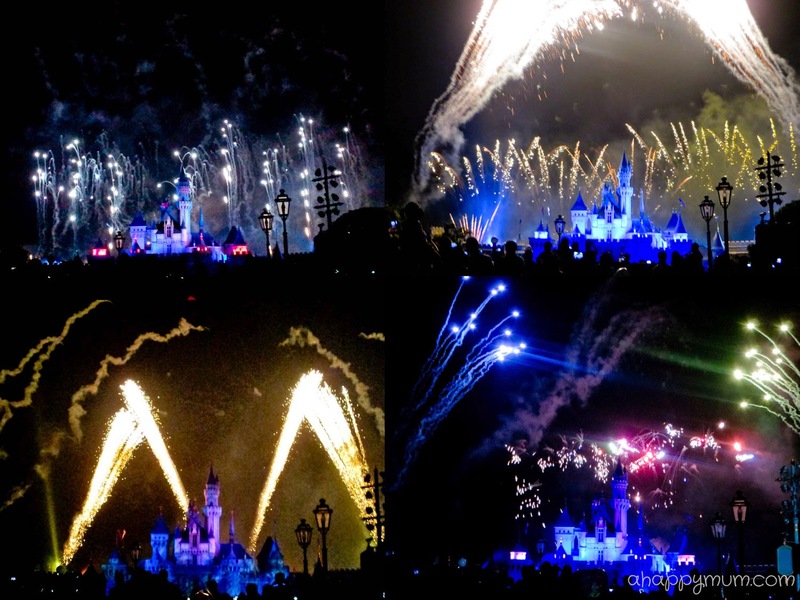 Even though we did not get to watch the night parade in Hong Kong Disneyland, we were treated to the awe-inspiring "Disney in the Stars" fireworks performance which takes place at 8:00pm (subject to change and weather conditions) at the Sleeping Beauty Castle. Do find a nice spot along Main Street, U.S.A and don't forget to get your cameras ready. It is definitely a spectacular show worth waiting for! Since this being such a special day, why not end it with a bang and leave behind everlasting, fond memories for the kids? 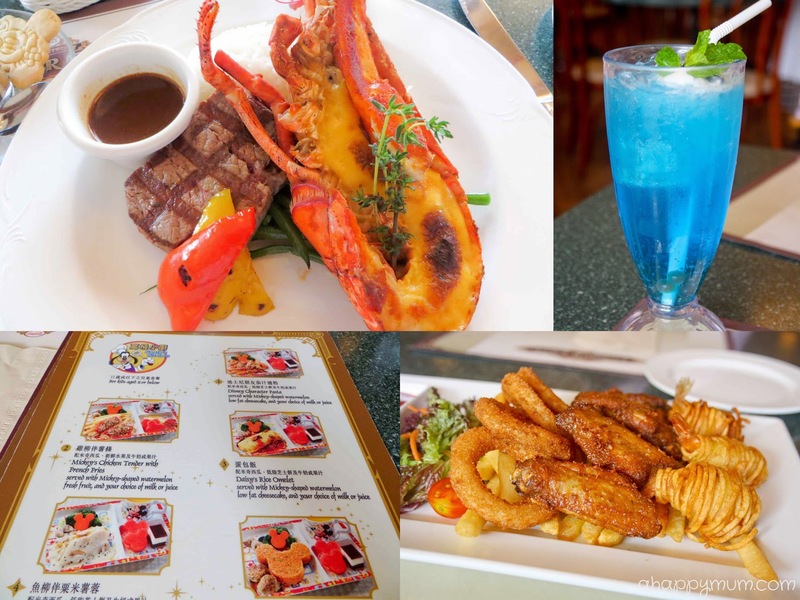 After a fun but exhausting day, what can be a better way than to treat yourself to a mouth-watering dinner buffet and bid farewell to the Disney characters up close? 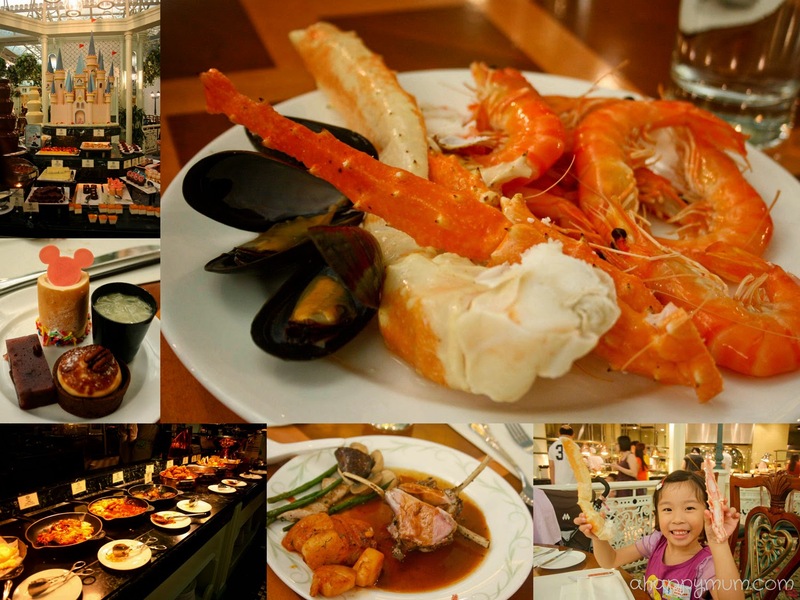 During the Character Dining experience in the Enchanted Garden Restaurant at Hong Kong Disneyland Hotel, you can indulge in a diversity of delicacies from sashimi, roasted duck to braised lamb and champagne crab legs while being surrounded by elegant Victorian furnishing. If it is a special occasion, you can also order a cake, birthday favours and invite your favourite Disney character to spend this unique celebration with your kids. 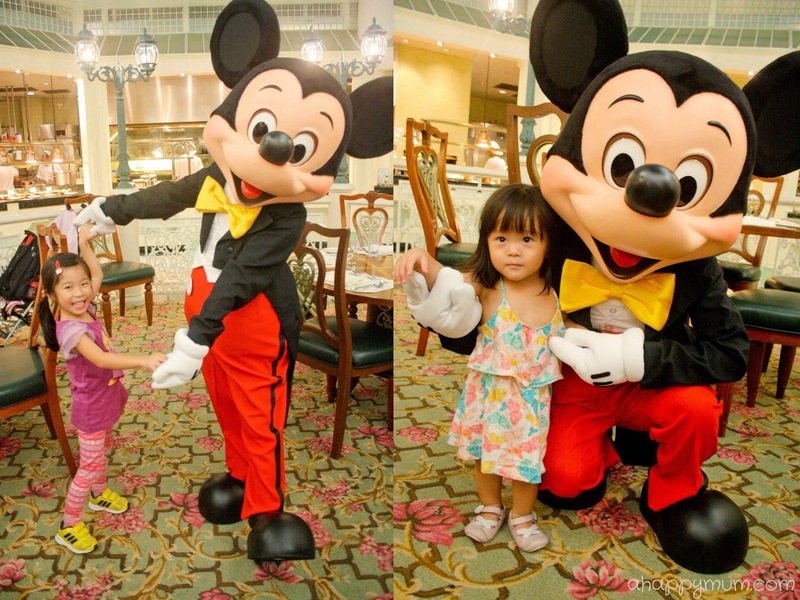 Even if it is not your special day, the Disney characters will still make a special visit to every table, take memorable photos with your family and spend time interacting with your kids. For instance, Ariel got to dance with Mickey Mouse while Ariel planted sweet kisses on every of the characters. It was the first time that Ariel came up close with the characters and I can't even describe to you how ecstatic she was. Every time she spotted one walking past, she would start to point and talk a string of gibberish that greatly amused us. For Angel, it was her second time meeting the Disney characters but that sense of euphoria in seeing them in real life will never diminish. It warmed my heart to see that my girls were truly the happiest kids in the universe that evening. Apart from the palatable, wide array of food, we were also blown away by the attentiveness and kindness of the staff. For instance, we waited long for Mickey to come to our table and were a tad disappointed when we were told he had to go for his break. The staff assured us that he would be back shortly and once he was, they directed him to our table where he spent a good, slow and pleasurable ten minutes interacting with the girls. That brought immense joy to our hearts and was a sweet gesture we truly appreciated. Of course, we also managed to take some precious family pictures as mementos and you bet it was an enchanting Disney evening we will never forget. 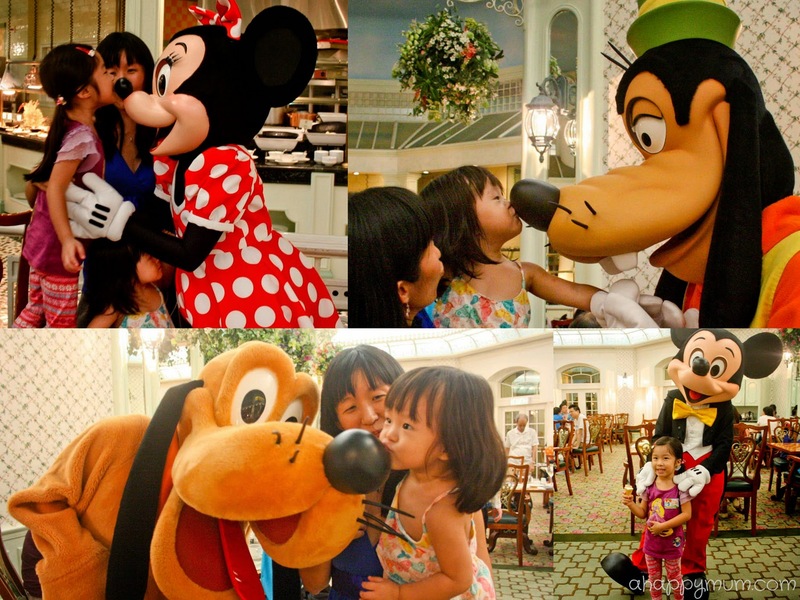 Now, won't you consider visiting the magical kingdom for your next family holiday? come true! We definitely hope to be back again! 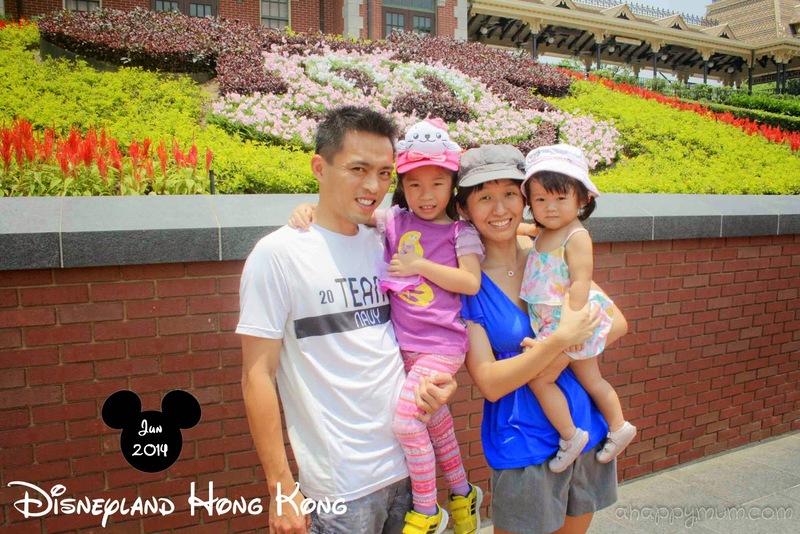 For more information on Hong Kong Disneyland, visit their webpage here. To book your park admission tickets, go here. For pricing and details on the character dining buffet, go here. Good news! 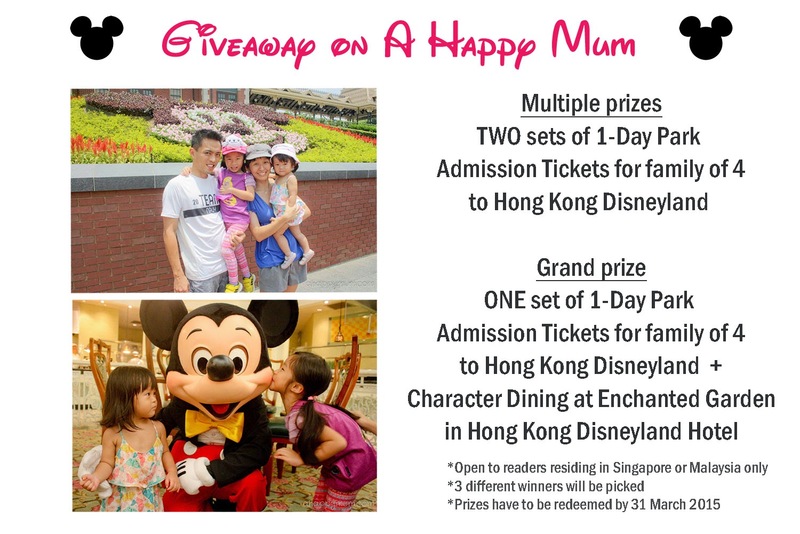 For those of you who are planning a family vacation to Hong Kong, A Happy Mum is now giving away the above prizes to three lucky readers! This giveaway is open to readers residing in Singapore and Malaysia only. Three different winners will be picked, first one drawn will be the grand prize winner and all prizes have to be redeemed by 31 March 2015. 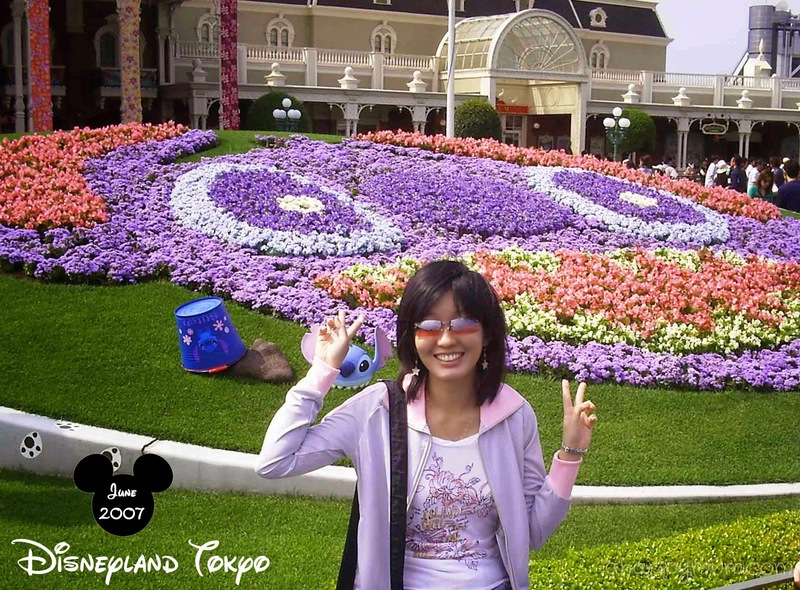 Name three of the lands in Hong Kong Disneyland. 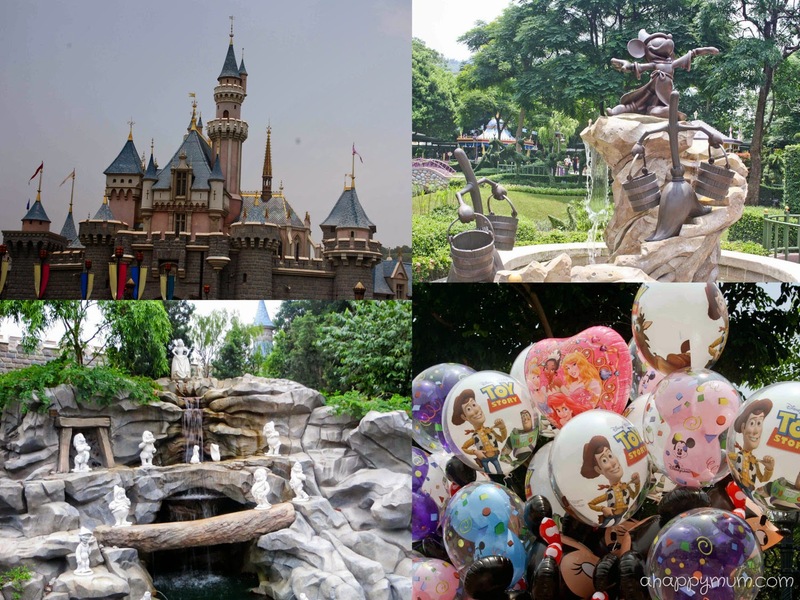 2) 'Like' Hong Kong Disneyland's Facebook page here. Indicate in the Rafflecopter widget that you have done the above and follow the rest of the options to increase your chances of winning. Best of luck! a Rafflecopter giveaway Disclosure: We were invited to meet the Disney characters and experience the dinner buffet at Enchanted Garden in Hong Kong Disneyland Hotel. Complimentary 1-day park tickets to Disneyland were also received. All opinions are my own. Why am I crying when I'm reading this happy post! It's just so lovely! I went to Disneyland when I was 16 and loves every bit of it. I'm going again and bringing the kids this time, in October, and I am more excited than ever! Pick me pick meeeeeee!!! The three lands are Adventureland, Fantasyland and Toy Story land. 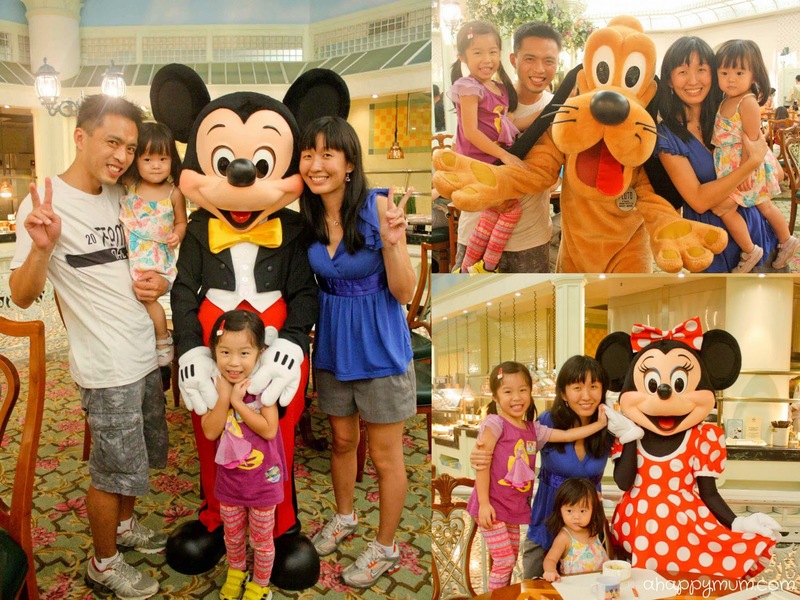 Hope to win and bring my 2 gals to visit Hong Kong Disneyland. Tomorrowland, Fantasyland & Toy Story land. Adventure Land, Toy Story Land, Fantasy Land. Ayra is going to be sooooo happy if we told her we're going to see the real Mickey and Minnie! Toy Story Land, Fantasyland and Adventureland. Hope i get picked!! Thanks for the awesome giveaway! Toy story land, Fantasy Land and Tomorrow Land. Oh, I was so excited I forgot to type in my email add... haha! Toystory Land, Adventure Land and Fantasy Land. It will be wish come true for my girls, as they were pestering for a trip to Disney in December. Well, good luck to us! Thanks for having this give-away! It will be the best surprise for the boys if they get it! Looking forward! Adventure land, toy story land,fantasy land! Thank you and wish me luck could wait to bring my children there! 3 lands are: Toy storey land, Adventure land and Fantasy land. Wish me luck to win. We want to have fun too!